HOURS OF ARCHIVES: Monday through Friday 10am - 1 pm or by appointment. If you desire to meet with the Aroostook County Genealogical Society genealogy archivist, please contact Brenda Bourgoine to make arrangements. The mission of the Archives and Special Collections is to identify, acquire, organize, preserve and make available materials about the history, culture, and people of the Caribou area and outlying communities in Aroostook County and portions of the State of Maine as it relates to Caribou. These materials are available to the genealogist, historians, scholars, students, and the general public. The library holds these materials in trust for future generations. Research and reference services: The Caribou Public Library Archives and Special Collections support genealogists, scholars, historians, students of all ages, the visitors to the region who are interested in local history or family genealogy and must be accompanied by an archivist or archival volunteer at all times. 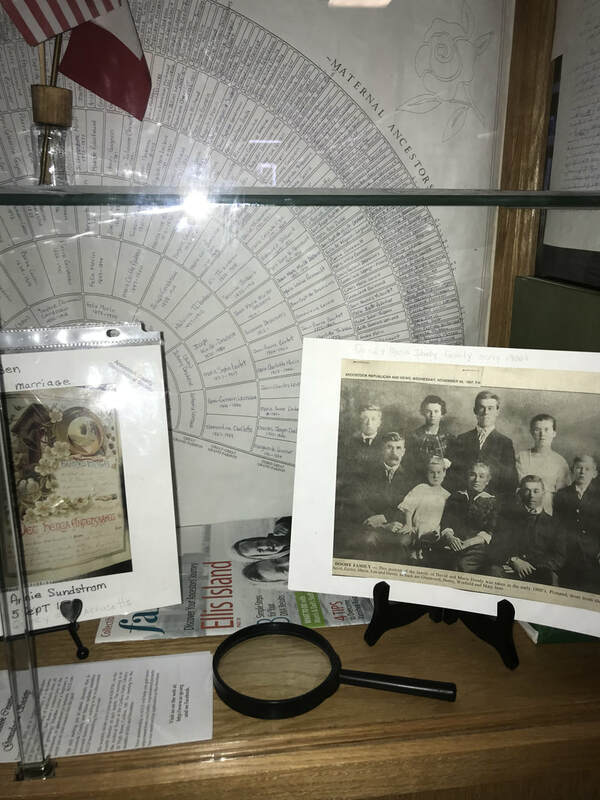 Exhibits: The Caribou Public Library shall exhibit items from its collections on a rotating basis and seeks to include items of an exhibitory nature in its collections that support ACGS. Outreach: The Archives and Special Collections along with the ACGS Research Center furthers the use and development of its materials to the local and regional community. Outreach is done through ongoing programs of various forms, including but not limited to tours, presentations, and workshop, and sponsorship of meetings, seminars, and conferences related to ACGS and the Archives and Special Collection’s mission. Publications: The Archives and Special Collections produce public relations brochures and other descriptive guides that help publicize its existence and information about ACGS. Grant writing: Together, CPL and ACGS will seek out collaborative grants to provide support for collection assessments, educational programming, facility and environmental control upgrades, housing materials, and staff training. Preservation: The Caribou Public Library Archives and Special Collections recognize that research, exhibition, handling, and storage of its materials must be consistent with sound preservation practices. Furthermore, the Caribou Public Library understand that the acquisition of collections brings with it an institutional commitment for responsible custody into the indefinite future. Preservation of collections requires appropriate environmental conditions, protective housing, fire prevention, detection, and suppression systems, an active security system and procedures, a disaster preparedness plan, and staff trained to handle and care for the collections appropriately. The Archivist reports to the Director of the Library. The Library Director meets with the City Manager, City Council, and the advisory board to keep them abreast of new collections and programs. The Library Director is expected to have an understanding of archive ethics, theories and standards to ensure proper stewardship of the collections and to follow best practices in archives practices. The Archivist (the director of library, if there is no archivist) is authorized, on behalf of the Caribou Public Library, to solicit, acquire, accession, appraise, arrange, describe, de-accession, and make available to our constituents the materials of the Archives and Special Collections. In no case shall anyone remove or destroy records from the Archives without the explicit permission of the Archivist (Library Director if there is no assigned archivist). The Archivist shall have the right of reasonable access to, and examination of, all archival records. The objective of our archival program is to act as a steward in preserving all materials of historical significance, mainly emanating from Caribou, Maine and the surrounding communities of Aroostook County as they relate to Caribou, and any selection of archival personal papers or records documenting the history of Maine that supports our Caribou materials. Records evaluated as archives for long-term preservation and reference includes Caribou area people or family, their cultures, places, institutions, and businesses in record formats including manuscripts, photographs, and functional/official records. Published works, will be collected as they are appraised to be instrumental in the study of the subjects in the same order as those of the Archives. Secondary collections: Surrounding communities in Aroostook County as they relate to Caribou. The library archives and special collections does not accept large artifacts such as furniture and equipment. These items may be of interest to the Caribou Historical Society. However, small artifacts relevant to the collections will be accepted. We do accept small artifacts that can be easily housed in boxes. First and foremost, the CPL archives and special collections is not a browsing library. The Archives and Special Collections materials are for supervised library use only and do not circulate. The Archives and Special Collections serves as a resource for persons researching the history and culture of the Caribou, Maine, Aroostook County, and portions of the State of Maine that support our documents. Its primary users are the genealogist, scholar, and historians. Secondary users are the general public, students, and visitors to the region. Specific inquiries for genealogical research are referred to the ACGS Research Center. Arrangement and description of collections will be as complete as resources allow. To the degree that funds are available, the Caribou Public Library will provide information about its Special Collections to regional (Maine Memory Network) and national databases (NUCMC—National Union Catalog of Manuscript Collections); this information may include visual as well as textual access. Hours of the Archives are limited and subject to change based on the availability of Director or archival staff. Currently, members of ACGS have open access to the archives without supervision as do some of our long-time scholarly researchers (List of names are provided at the Circulation desk). For visiting patrons and students, the Director or archival staff/volunteer must be present.